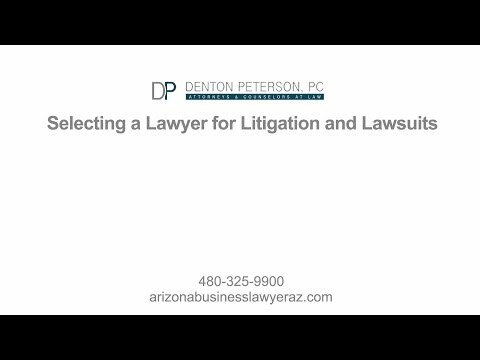 Phoenix Litigation Lawyers & Appellate Attorneys at Denton Peterson, P.C. No one wants to have to go to court to defend against a lawsuit – nor does anyone ever really want to have to bring a lawsuit against an employee, a business partner, or a supplier. Lawsuits are time-consuming, expensive and stressful. Yet sometimes, litigation is unavoidable. The best thing you can do is hire an experienced Phoenix litigation lawyer who will significantly improve your chances of success and who will make the whole process a little easier to get through. The attorneys at Denton Peterson PC have a proven record of accomplishment with business and corporate litigation thanks to their extensive experience and unique approach. Our attorneys have several decades of experience in litigation, and they have a track record of success in all types of litigation cases at the trial and appellate level. Business and corporate, including among other types of claim, breach of contract, interference with business expectations, negligence, breach of fiduciary duty, breach of duty of good faith and fair dealing, fraud, etc. You can count on our experience and legal expertise to guide you through the complex litigation process. We are committed to helping you achieve your goals, and our attorneys are fierce legal advocates for our clients. Too often, clients feel like cogs in the machine at other law firms. They are treated like identical parts in a larger system. At Denton Peterson, we take the time to understand your specific situation and to discuss how we can assist you in meeting your goals. We understand that each case is as unique you are. We don’t use the same approach to every case because every case is different. To determine the best strategy for each case, we spend a lot of time with you, going over all the details of the case, and we take the time to make sure we understand what you hope to achieve. We really get to know you and all the circumstances involved before we start putting together a plan. We will also let you know if we believe that you have unrealistic expectations. Call us today to talk with a Phoenix litigation lawyer about your needs and to start discussing your legal options. While putting together a strategy, our attorneys also sort through all the complex circumstances in your case to understand which are the most important to determining the outcome. In some cases, we will need to look at the tiniest of details. In others, we must use a broader approach. The only way to find out for sure is to get to know the case and our clients very well, and we are committed to that process. Our attorneys remain flexible so that they can change course when appropriate. That might mean creating a new strategy for your litigation, or it might mean determining that litigation isn’t the best course of action at all. Our attorneys are skilled in negotiation, mediation and arbitration as alternative dispute resolution options. At Denton Peterson, our attorneys really care about our clients. You won’t have to call repeatedly to get someone to talk to you, and you won’t feel like you are getting the brush off when you do. Our knowledgeable paralegals and attorneys are readily available to answer all your questions and concerns so that you feel informed and comfortable throughout the litigation process. We strive to keep an open line of communication to build a strong relationship with clients and to improve the chances of success in litigation.Not only will our attorneys be available when you need them, but they will also be fully prepared for every meeting, every conversation, and every court proceeding. You can feel informed and confident at every point of the litigation process. Our attorneys will make sure you have all the information you need to make the best decisions, including a thorough understanding of the legal issues at hand and the potential risks. The Phoenix litigation lawyers at Denton Peterson are fierce advocates for our clients. Once we have determined what your goals are for your litigation, these become our goals, and we will use all the legal tools available to achieve them. Our experienced attorneys represent companies of all sizes and in all types of industries. Call us today to talk with a Phoenix litigation lawyer about your needs and to start discussing your legal options. We are ready to help you.